A 2000-year-old painted Roman statue is being digitally restored to her original glory by scientists from the University of Southampton and the Herculaneum Conservation Project with the University of Warwick. The head of the statue was discovered in the ancient ruins of Herculaneum in 2006, a town preserved in the same eruption of Mount Vesuvius that buried nearby Pompeii in AD 79, during works by the Herculaneum Conservation Project in the area of the Roman basilica. The statue is believed to represent a wounded Amazon warrior, complete with painted hair and eyes. The organic pigments are exceptionally well-preserved because of the particular nature of Herculaneum's burial under volcanic ash. Recognising the potential of the latest digital technology to record and study the statue, archaeologists at the University of Southampton and the Herculaneum Conservation Project contacted the University of Warwick's Warwick Manufacturing Group (WMG) after hearing about the Group's expertise in three key technologies: high resolution laser scanning, rapid prototyping and ultra-realistic computer graphics. 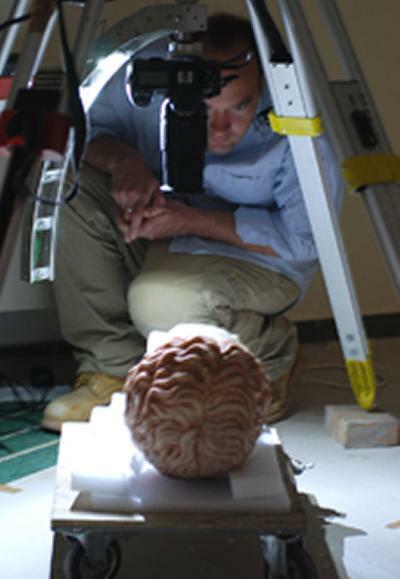 A team from WMG visited the state to measure every surface of the head to within 0.05 of a millimetre and translated that information into a computer model. Rapid prototyping was then used to create a physical 3-D model of the head revealing the smallest detail. Further recording was carried out on site by experts in archaeological computing from the University of Southampton, led by Dr Graeme Earl of the Archaeological Computing Research Group, using a novel form of photography to provide an extremely detailed record of the texture and colour of the painted surfaces. Dr Earl said: "Cutting-edge techniques are vital to the recording of cultural heritage material, since so much remains unstudied or too fragile to analyse. Our work at Southampton attempts to bridge the gap between computing and archaeology in bringing the best that colleagues in engineering have to offer to unique artefacts from our past. It also allows us to create models of how past objects and places may have appeared, and even how they felt and sounded." The Southampton team is now digitally re-modelling and re-painting the head of the statue, using techniques derived from the film industry and the high performance computing facilities available at the University of Southampton to recreate the original carved and painted surfaces. Dr Mark Williams of WMG took his team and equipment to the site in order to produce the laser scans. These were then processed back in Warwick and the data passed to Dr Earl's team. In the final step Professor Alan Chalmers, head of WMG's visualisation team and an expert in ultra-realistic graphics, will take the computer model and apply techniques to exactly reproduce the lighting and environmental conditions under which the painted statue would have originally been created and displayed. The work will be used both for educational and research purposes to give new insights into the statue's design, to provide a record for conservators, and to explore how it may have been appreciated over 2000 years ago. Dr Earl adds: "Far more than a pretty picture, this visualisation will provide us with an otherwise impossible view of how the original statue may have looked in context, and allow us to experiment with alternative hypotheses about its origins. Painted statues from this period are unusual and digital technologies offer a host of new possibilities to researchers in archaeology. Over the coming year we will be working with experts in Roman sculpture and painting from around the world in order to produce the most accurate simulations possible."